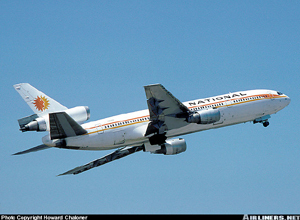 On November 3, 1973, while National Airlines DC-10 Flight 27, from Miami to San Francisco, was cruising at 39,000 feet, the number 3 engine fan assembly completely disintegrated. The number 3 inlet and fan case separated simultaneously with fan blade liberation, allowing the blades to impact the airplane at high speed. The liberated blades struck the fuselage, right wing, engines number 1 and 2, and caused a cabin window to fail. This resulted in the expulsion of one passenger through the opening during the rapid decompression. Many passenger oxygen masks failed to deploy, causing a panic among the remaining passengers. At the time of the number 3 fan failure, the pilot and flight engineer were experimenting with the relationship between the engine's fan speed (N1) signals and the automatic flight control systems. After the crew heard an explosion and cabin decompression, they declared an emergency and executed an emergency descent. There was an uneventful landing at Albuquerque, New Mexico. The National Transportation Safety Board (NTSB) determined that the probable cause of this accident was the disintegration of the number 3 engine fan assembly as a result of interaction between the fan blade tips and the fan case. The precise cause of the engine failure was not completely identified during the course of the investigation. Subsequent research by the engine and airframe manufacturers determined that the engine fan and fan case exhibited a vibratory coupling phenomenon that later became known as the "interactive mode."